The dog shows up the way snow does on a winter's day. She just drifts in and stays, becoming the friend of a young Cree boy. The boy and the dog set out on an adventure that ends in a quandary involving quills and a big brother who swears to take revenge on the porcupine. But Lindy, a Cree elder and master carver, reminds the brothers of the importance of the great porcupine. After a day spent carving in town, the boy learns some truths about human nature and realizes that sometimes, like the porcupine, you must put your quills up to keep from getting pushed around. 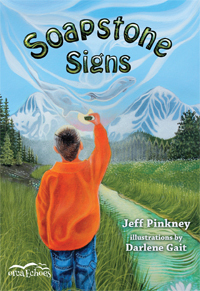 Soapstone Porcupine is the second book, after Soapstone Signs, narrated by a young Cree boy. "Offers insight to the Cree culture. Recommended." "The integration of the Cree language and representation of a contemporary Cree family is laudable and something not often seen in chapter books." "This book provides a great way to learn new words in Cree, as there are several words in Cree used throughout the book, which are in a pronunciation guide at the end." "A quiet tale about a sensitive soul." 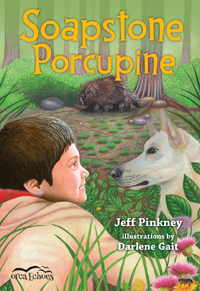 "Soapstone Porcupine will add value to any school library, public library or home library. Readers will learn about the way of life for people of a James Bay Cree community and learn parts of the Moose Cree language. This book is perfect for the young reader ready to read independently. "